Exploring the city of Budapest does not mean that you need to tread all day around: taking a Budapest Segway tour or a comfortable river Danube cruise in Budapest is always a great option. Are you a beginner? No problem at all: just the right time to start your 10 minute training on a Segway! It is just that easy, and that natural. Nothing like a bike. 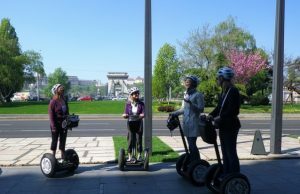 We can warmly recommend some of the best tours in Budapest on Segway. Entertaining, interactive, and essential tours. Many first time tourists are surprised to see that there is so much to explore in the city of Budapest that a 3 day visit is only a taster, scratching the surface. Indeed, Budapest is a city of 2 million with dozens of major attractions, and even more great tours, events, festivals and activities. Segway is one of them. 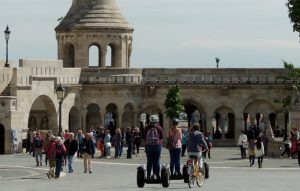 Enjoy a city sightseeing while Segwaying along UNESCO World Heritage sights. Hours can vary between 1 or 2.5 hours. Buda Castle is full of great attractions as Budapest’s Castle District has its own intimate town atmosphere (city in the city), enclosed by the Castle walls. 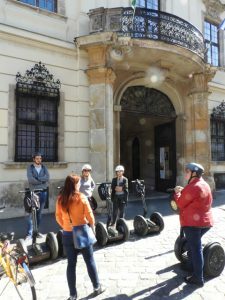 While a walking tour would easily mean 2 – 4 hours of exploration on foot, the Buda Castle Segway Tour makes it a compact 1 hour sightseeing. City Park Segway Tour of Budapest to see the Heroes’ Square with the Millennium Monument, Andrassy Avenue (UNESCO World Heritage site), the Vajdahunyad Castle and the City Park Palace (Ice Rink in winter months), Szechenyi Baths are on the route of this scenic and sleek sightseeing Segway Tour.